The bank statement for August 2018 shows an ending balance of $3,490. On August 31 the bank statement shows charges of $35 for the service charge for maintaining the checking account. On August 28 the bank statement shows a return item of $100 plus a related bank fee of $10. The return item is a customer's check that was returned because of insufficient funds. The check was also marked "do not redeposit." The bank statement shows a charge of $80 for check printing on August 20. The bank statement shows that $8 was added to the checking account on August 31 for interest earned by the company during the month of August. The bank statement shows that a note receivable of $1,000 was collected by the bank on August 29 and was deposited into the company's account. On the same day, the bank withdrew $40 from the company's account as a fee for collecting the note receivable. The company's Cash account at the end of August shows a balance of $967. During the month of August the company wrote checks totaling more than $50,000. As of August 31 $3,021 of the checks written in August had not yet cleared the bank and $200 of checks written in June had not yet cleared the bank. The $1,450 of cash received by the company on August 31 was recorded on the company's books as of August 31. However, the $1,450 of cash receipts was deposited at the bank on the morning of September 1. On August 29 the company's Cash account shows cash sales of $145. The bank statement shows the amount deposited was actually $154. The company reviewed the transactions and found that $154 was the correct amount. 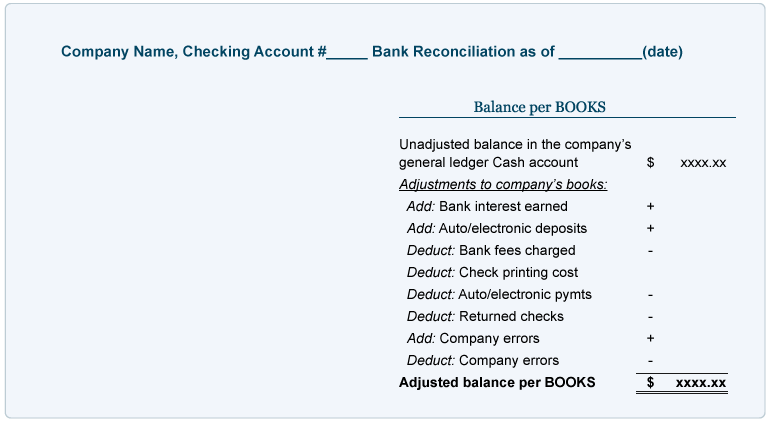 Before we begin our sample bank reconciliation, learn the following bank reconciliation tip. Put it where it isn't. If an item appears on the bank statement but not on the company's books, the item is probably going to be an adjustment to the Cash balance on (per) the company's books. If an item is already in the company's Cash account, but has not yet appeared on the bank statement, the item is probably an adjustment to the balance per the bank statement. 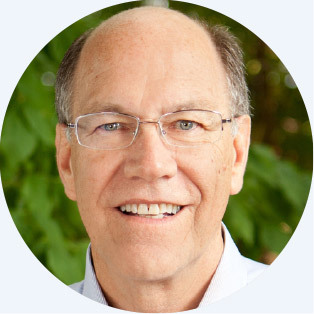 Our approach to the bank reconciliation is to prepare two schedules. The first schedule begins with the ending balance on the bank statement. We refer to this schedule as Step 1. The second schedule begins with the ending Cash account balance in the general ledger. We call this schedule Step 2. Items 1 through 10 above have been sorted into the following schedules labeled Step 1 and Step 2. The item number is shown in the far right column of each schedule. Step 2 begins with the balance in the company's Cash account found in its general ledger. 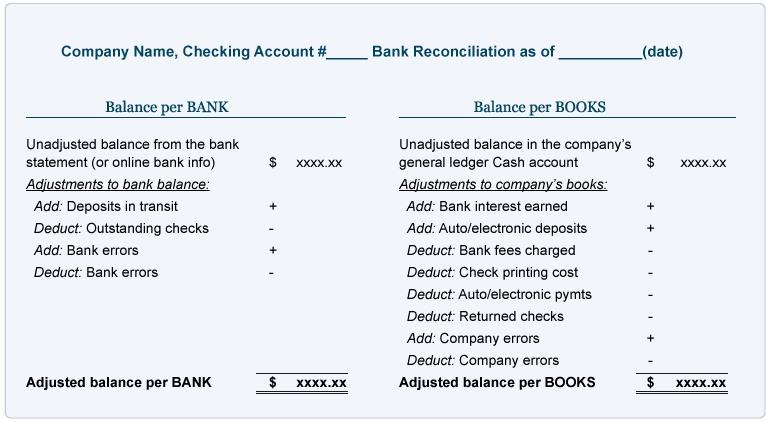 The bank reconciliation process includes listing the items that will adjust the Cash account balance to become the true cash balance. We will review each item appearing in Step 2 and the related journal entry that is required. Remember that any adjustment to the company's Cash account requires a journal entry. Generally, the adjustments to the books are the result of items found on the bank statement but have not yet been entered in the company's Cash account. Item #2 Bank service charges. Since the bank deducted $35 from the company's checking account, but the company has not yet deducted this from its Cash account, the following journal entry needs to be made. Item #4 Check printing charges. 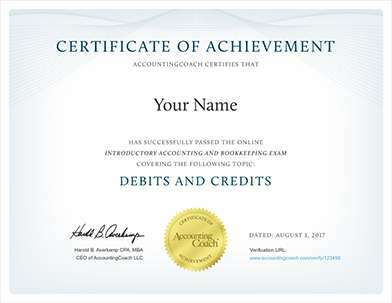 Because this expense is not yet entered on the company's books, but the amount has been deducted from its bank account, the company will make the following journal entry. Item #5 Interest earned. The bank increased the checking account balance by $8 on August 31. Since the bank did not notify the company previously, the company must now increase the balance in its Cash account. Item #6 Notes receivable collected. The bank increased the company's checking account when it collected a note for the company on August 29. It was determined that the company had not yet made an entry to its Cash account for this transaction. As a result the following journal entry is needed. In the above schedules the adjusted balance for Step 1 is $1,719 and the adjusted balance for Step 2 is $1,719. The company believes that all items involving cash have been included in the schedules. As a result the company has successfully completed its bank reconciliation as of the August 31, 2018.